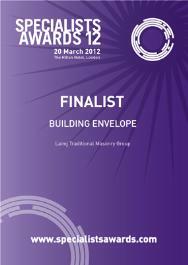 LTM are pleased to announce that we have been shortlisted in the ‘Building Envelope’ category of the 2012 Specialist Awards. The annual Specialist Awards recognise the work of specialist contractors working in the construction industry. There are four other finalists competing in the Envelope category and the results will be announced on Tuesday 20 March at London Hilton, Park Lane.